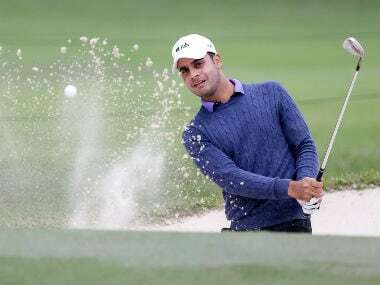 Augusta: Set to play with 1987 winner Larry Mize and local Georgia man Russell Henley in the first round, India's latest golfing sensation Shubhankar Sharma, a special invitee to the Masters, is already attracting a lot of attention and he is loving it. "If all this helps to push golf in India, I am happy. I know there are a lot of good players back home and if I can inspire others to take up and some day get here and on PGA Tour, it will be fantastic," said Sharma. He admitted he liked being the new young face of Indian golf. The return of Tiger Woods after missing 2016 and 2017, have brought crowds in bigger numbers. Tiger has been the big buzz. Coming on the heels of T-12, T-2 and T-5 in his last three starts, this comeback has seen him devoid of pain, which had become a part of his life since four surgeries and other problems. There are just 87 players and barring the 2017 US Open winner, Brooks Koepka, every top player is here. That includes two left-handers, Phil Mickelson or Bubba Watson, who have won five of the seven Masters held in even numbered years since 2004. Justin Thomas is in great form; Rory McIlroy needs only a Masters Green Jacket to complete a Grand Slam of Majors; Spieth wants a second Masters and there is Jason Day, who has a Major from PGA Championships but wants a Green Jacket and Rickie Fowler, who still has no Majors. Add to them World No. 1 Dustin Johnson, who slipped down the stairs to his house a day before 2017 Masters and had to pull out. Last year Sergio Garcia ended all debates on why he has not won a Major. He won the 2017 Masters and now with a daughter named after Azalea, after famed flowers at Augusta National, he would love a repeat of that Masters win. Back to Sharma, it was on the Tuesday of the week of the Hero Indian Open last month, which is his National Open, that he got a call from Hootie Johnson from the Augusta National. Sharma was still on the flight returning from WGC-Mexico. On returning home, he saw a mail in his in-box from Augusta asking him to call back. "I thought it could be an invite, but I didn't want to raise my expectations. I made the call and they said they wanted to invite me," he recalled. "I was very excited. There were some friends and we enjoyed that moment. Next day on the Masters site, it said I had accepted the invitation. I said, who wouldn't. It is everybody's dream to play here." A lot has happened since then and Sharma is in Augusta now with his family and friends. Going back a little over 10 years, Jeev Milkha Singh from Chandigarh became the first Indian golfer to tee off at the Augusta Masters. Now it is 2018 and another Chandigarh golfer, all of 21, caught the eye of the Tournament Committee at the Augusta National to get 'invited' to the Masters. Since Jeev, Arjun Atwal and Anirban Lahiri, too have played at Augusta. In the last few weeks, Sharma has played with Phil Mickelson in the lead group at WGC-Mexico on Sunday, with Sergio Garcia at the WGC-Match play and so he can rightfully dream of playing with Tiger at the Masters. "I know everyone will be following Tiger. I did too when I used to watch him on TV," said Sharma. Now the difference is he is in the field with Woods. Accompanied by family and friends, he arrived at Augusta. "We drove down the Washington Road I know all the names by heart and suddenly took a right turn and there it was, the Magnolia Drive. The trees and the sunlight filtering through it was beautiful and just what I had imagined." On Monday, Sharma played nine holes on the front, took a break and played another nine in the afternoon. Yesterday, after a lengthy press conference, where international reporters were trying to cull as much as possible from him, Sharma was back on the course. Today, his father Col ML Sharma will be there for the Par-3 contest as his caddie. The father-son duo have lived the golf dream together. 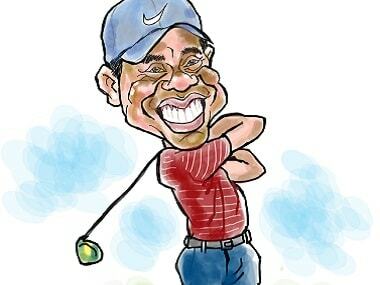 "My father first saw a golf course in 2002, courtesy Anirban Lahiri's father (Tushar), who was a doctor in the Army. "I actually got started to think about golf seriously around 2007-08 and saw my first Masters live on TV in 2007, when Zach Johnson won. Later I saw all Masters editions on Youtube," said Sharma.